A month ago I have finally become an Australian citizen. Such an important occasion called for a special outfit. Any sensible person would have bought something suitable. Me? I decided to sew for myself. I had a few metres of black cotton fabric with pretty floral print that I purchased from an op shop for just a couple of dollars last year. 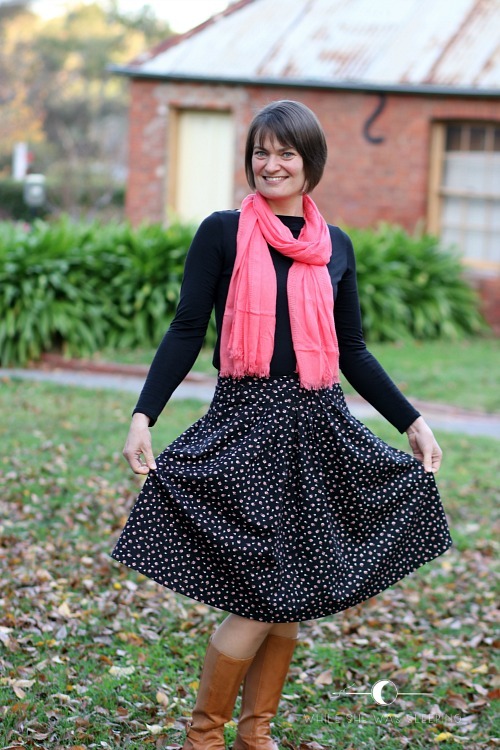 I thought it would look rather cute as a Vintage Style Skirt, a free pattern by In the Folds for Peppermint magazine. 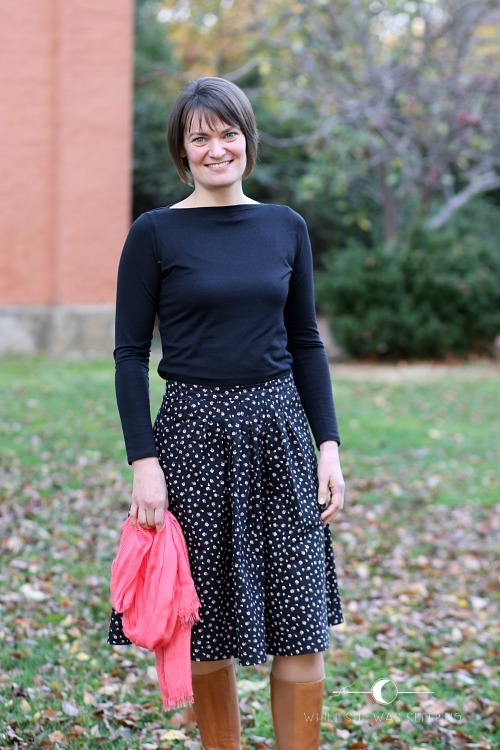 My choice of a pattern was influenced by the lovely skirts that Maaike and Kate created. This pattern is fabulous! Every notch, every piece line up beautifully. The pattern has layers and comes in both print-at-home and A0 formats. The instructions are clear and detailed. The fit is spot on. The hem of the skirt is finished with facings, which I absolutely love! 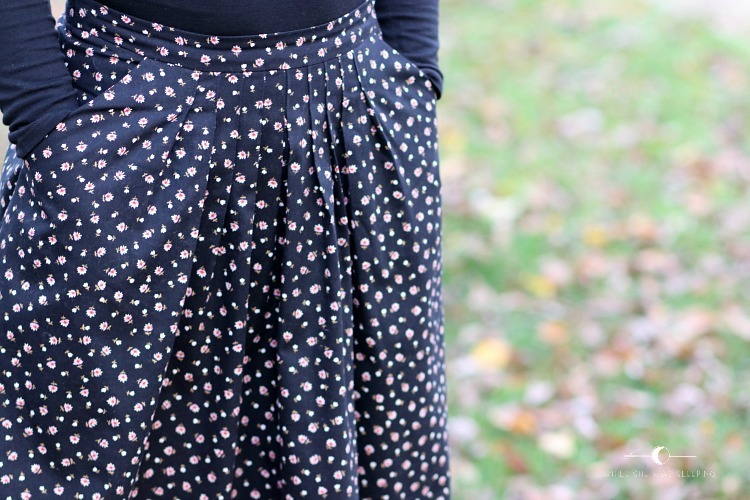 The skirt closes with an invisible zipper at the centre back. 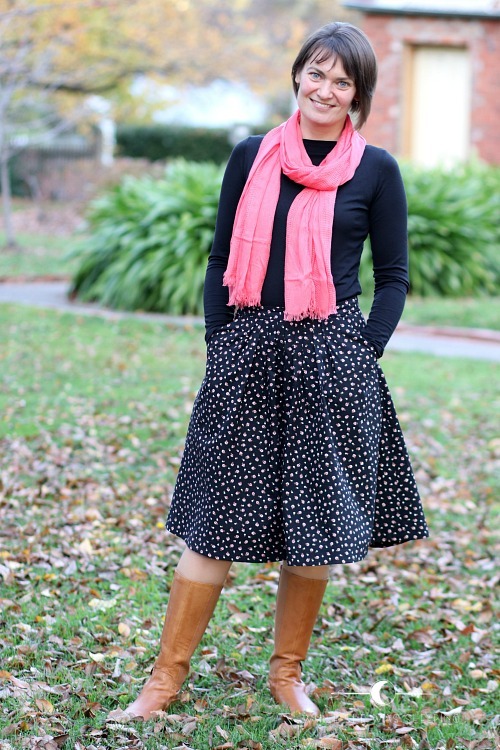 The best features of this skirt (in my humble opinion) are the generous sized pockets and enough pleats to make my heart sing! Yes, I am that weird person who finds sewing pleats therapeutic. I promise my pleats and the waistband looked nicer before they were squashed by a jacket and a seat belt for about an hour! But how could I not requested a close up shot? It appears that Maaike, Kate and I can easily swap our skirts as all three of us made the same size, C. I made no alterations to the pattern. Now I had a skirt I wanted to make a top to go with it. I chose the Brigitte top by Tessuti. 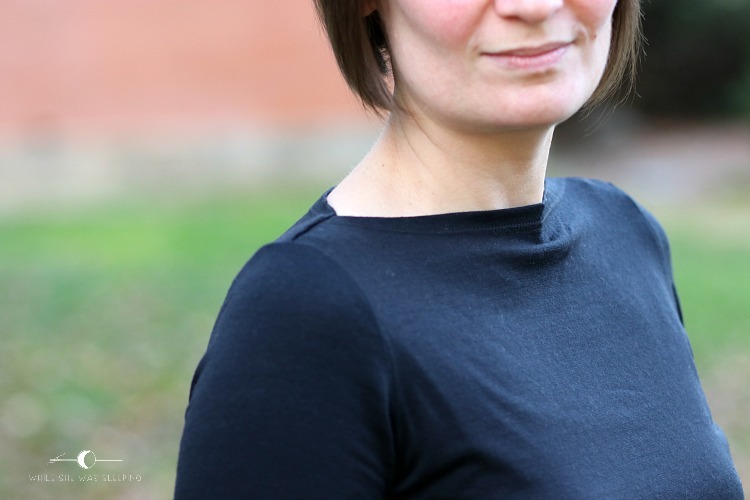 I made my top from luxurious merino/lycra jersey form the Fabric Store. The fabric is soft and warm, however I don't think it worked well for this pattern. This fabric is lightweight and I don't feel comfortable wearing the top without a cami underneath. Not really the look I was going for, but I felt too uncomfortable showing the outline of my bra! While I love the skirt and the top on their own, I don't really like them worn together. I did wear them together for the ceremony (paired up with a cardigan), and then again for the photo shoot. However I usually wear this top with jeans, it looks better that way. I have read in a few reviews of the Brigitte top that neckline on the front of the top was too high. 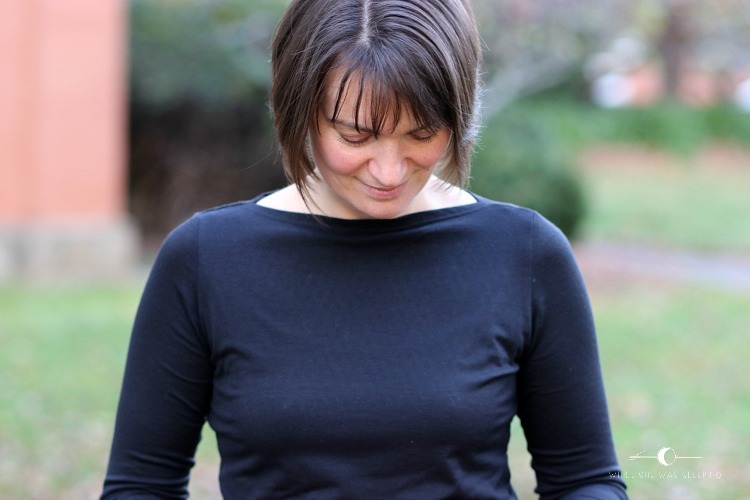 I tried my top on a couple of times while sewing it and the neckline appeared just fine. I wore this top out and about for a months and did not realise I had a fold happening until I looked at the photos! I guess next time I use this pattern I will be lowering the neckline on the front pattern piece also! All in all it is a super comfortable top that can easily be made in one evening. Apart from the neckline issue the fit is just fine. It is not too loose, not too fitted. For the record mine is size 10. Now to choose a more suitable fabric and make a couple more! Wow, that is a free pattern?! It looks SO good. I love pleats too - way way more than sewing gathers. The whole outfit is fantastic. Works for everyday and more special occasions depending on styling. I love clothes like that! Thank you Mie. Yes, such a high quality pattern, and it is free! I can see a few of these skirts made up in the near future! Congratulations! I actually really like the two pieces together. The neckline on that top is very elegant; I did not notice the theist wrinkle until I saw that close up shot. What a gorgeous outfit - I think they go well together! That said, I would probably wear the top more with jeans, too ;) And that skirt! What a beautiful pairing with the floral print! Love the outfit! Congrats again! Thank you Emily :) I prepared fabric to make another top - with a lowered neckline this time :) it is simply too comfy to not try again! Wow, love the whole outfit!